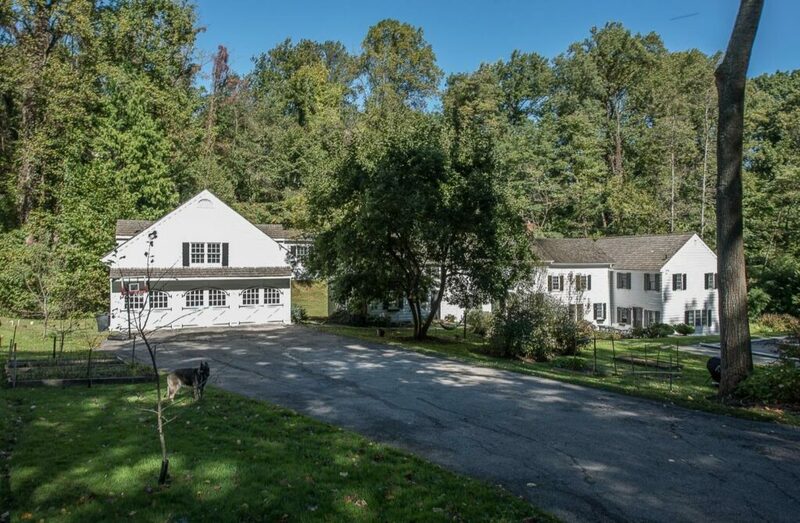 1436 Monk Road is a 4.7 acre enchanted natural paradise of woodlands that is intensely private, with the astonishing physical beauty and peacefulness of a secluded Pennsylvania river valley, all located on Monk Road, moments from the center of the Village of Gladwyne. A large, comfortable farmhouse of over 5,000 sq ft offers an abundance of space as a true country retreat, with large bright and sunny bedrooms, upgraded bathrooms, formal reception rooms and a cozy, paneled den with fireplace. Dreamy, open modern commercial kitchen and large sunny family and breakfast room have glass doors to a kitchen patio and garden. Beautiful rough hewn hardwood floors and an inviting spring fed swimming pool all surrounded by gentle streams, pastures, orchards, gardens and garages. Entirely suitable for equestrian, agrarian and country pursuits, with a bank barn of stalls, lofts, tack and office and miles of bridle trails accessed on and immediately adjacent to the Property. This compound is located within 5 miles of center city Philadelphia for an easy commute to get away from it all, in moments. Engineering survey shows the entirety as formerly two separate lots. Underground electrical service is fully upgraded, provides consistent energy security. Certified spring feeds Property with artesian spring water for domestic water service. PA DEP designed, monitored and approved on-site underground waste water treatment facility. Completely re constructed, private driveway w turn outs, drainage systems and common maintenance agreement among neighbors for plowing.